Each month as part of this series from the AAS Historical Astronomy Division, an important discovery or memorable event in the history of astronomy will be highlighted. This month's guest author, Sara Turriziani (RIKEN), focuses on the BeppoSAX mission launched in April 1996. Interested in writing a short (500-word) column? Instructions along wth previous history columns are available on the HAD webpage. The Italian-Dutch SAX (Satellite per l’Astronomia a raggi X [Satellite for X-ray Astronomy]) was launched from Cape Canaveral on 30 April 1996 with the primary goal to better characterize celestial sources emitting X-rays. Its instruments covered for the first time a very wide range of energies, from 0.1 keV to 600 keV. It was later renamed BeppoSAX to honor the Italian physicist Giuseppe “Beppo” Occhialini.1 BeppoSAX marked the end of one era and the beginning of another in the study of gamma-ray bursts (GRBs). For two decades after the initial discovery, several satellites continued to record GRBs, and about 100 different models were proposed, yet a clear explanation was still missing. The most urgent question was to determine at what distance they were from Earth. A new milestone was set when the Compton Gamma Ray Observatory, launched in 1991, established that GRBs come from all celestial directions. Although this finding hinted that the sources were at cosmological distances3, it could not exclude that they were instead much closer, in the halo of the Milky Way.4 Unfortunately, at the time the positional accuracy of gamma-ray detectors was too poor to allow for follow-up to detect the so-called afterglow emission, predicted to accompany GRBs at lower energies. On 30 April 2002 the mission concluded its operations. Almost exactly one year later, on 29 April 2003, the satellite reentered Earth's atmosphere. Whatever pieces survived reentry sank into the Pacific Ocean. 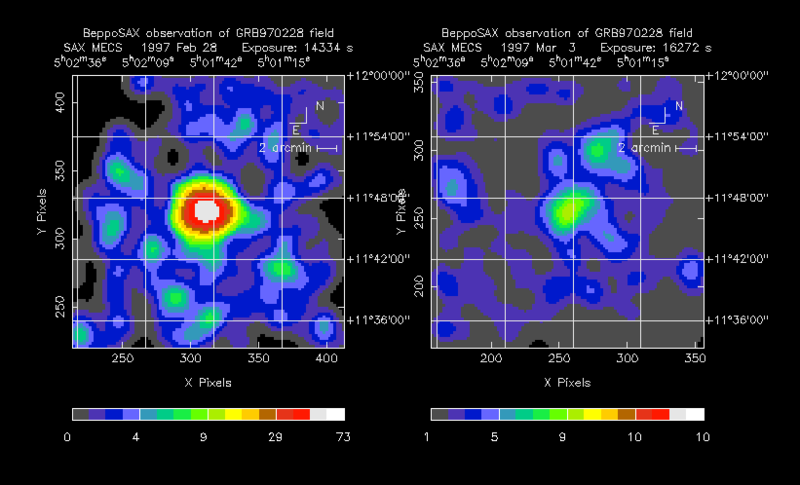 Luminosity evolution in the X-ray band of GRB 970228 observed by BeppoSAX in the first months of 1997: from 28 February (left panel) to 3 March (right panel) the energy decreased by a factor of 100. (Credit: BeppoSAX Team, ASI, ESA). 1. Boella, G., Butler, R. C., Perola, G. C., et al. 1997, A&AS, 122, 299. 2. Klebesadel, R. W., Strong, I. B., & Olson, R. A. 1973, ApJ, 182, L85. 3. Paczynski, B. 1995, PASP, 107, 1167. 4. Lamb, D. Q., 1995, PASP, 107, 1152. 5. Costa, E., Frontera, F., Heise, J., et al. 1997, Nature, 387, 783. 6. van Paradijs, J., Groot, P. J., Galama, T., et al. 1997, Nature, 386, 686.